Revenue in the Shawls & Scarves segment amounts to US$24,851m in 2019. The market is expected to grow annually by 6.6% (CAGR 2019-2023). In global comparison, most revenue is generated in China (US$6,528m in 2019). In relation to total population figures, per person revenues of US$3.38 are generated in 2019. Shawls, scarves and mufflers are clothing accessories worn over the shoulders, neck or head for protective or decorative purposes. Since the incorporated input data from statistical offices partially measure shawls, scarves and mufflers in terms of kilograms the data has been converted to unit sales. Reading Support Revenue in the Shawls & Scarves segment amounts to US$24,851m in 2019. Reading Support The Shawls & Scarves segment is expected to show a revenue growth of 7.4% in 2020. Reading Support The average revenue per person in the market for Shawls & Scarves amounts to US$3.38 in 2019. Reading Support In the market for Shawls & Scarves, volume is expected to amount to 4,513.67 m pcs. by 2023. Reading Support The market for Shawls & Scarves is expected to show a volume growth of 2.0% in 2020. 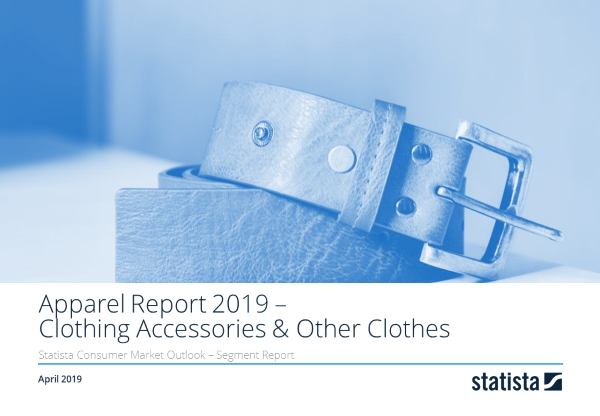 Reading Support The average volume per person in the market for Shawls & Scarves amounts to 0.6 pieces in 2019. Reading Support The average price per unit in the market for Shawls & Scarves amounts to US$5.85 in 2019. Reading Support With a market volume of US$6,528m in 2019, most revenue is generated in China. Here you can find more studies and statistics about "Shawls & Scarves".